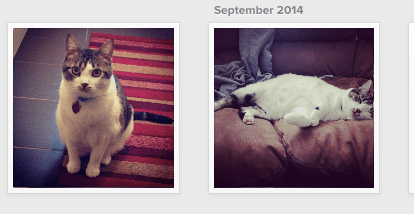 Six months ago I was a cat lady. Crazy cat lady? You be the judge. Here’s a snippet of my Instagram feed. My bio: “Maybe a crazy cat lady” because my feed was all cats, all the time. I loved my cats. A real love. They were true companions. And they loved us back. But today I did something I never, ever thought I would do: I surrendered my cats to a cat shelter. We had our reasons that balance carefully along the blurry lines of being good enough and hardly worth mentioning; allergies, a new baby, too much ruined furniture, no time… We made lists ~ pros, cons… We slept on it. But what it boils down to is change. We’ve changed, our lives have drastically changed, and our loving, sweet cats no longer fit. I’m shocked we did it. I feel guilt and shame. I feel relief. When you become a Parent they tell you, “everything changes” and for the love of God – every. thing. changes. In being so profoundly swept up in love, what used to be important suddenly matters less. A concept of the heart so complex, perhaps only Parents can understand. This change, unlike change we had experienced before it, carries with it a ripple effect in that the aftershock of it keeps on going and going and going… Like a rock skipping across the water, the ripples of this change continue. What at first was solely a change of lifestyle ~ less pubs, more picnics; less sleep, more naps ~ this change is constantly pushing itself forward and exposing itself in more and more areas of our lives. It changed us as individuals, as a couple, and our relationships with others; it evolved our values, it shifted our perspectives, it forever transformed our hearts. This change is everlasting. Although the ripple effects of this change hurt a bit, it’s worth it to feel our hearts expand like this. It’s magical and beautiful and worth every little thing.